Today is my 2nd recipe entry for the RedPack Tomato contest I wrote about yesterday. This recipe is one of my dad’s favorite meals, and since we are trying to eat healthy, I decided to give it a healthy spin. Here’s the original, followed by my heart healthy adaptation. This might have to be something I pull together for a night at Grandma’s soon! Heat tomato soup, water, and tomato paste in a large pan. Add cabbage cubes. In a separate bowl, combine turkey, rice, onion, egg, and a pinch of salt. Add the meat mixture to the heated tomato mixture and cook about an hour on medium heat (stove top). This is similar to a casserole and includes a good amount of veggies and lean meat for your heart. Delicious! 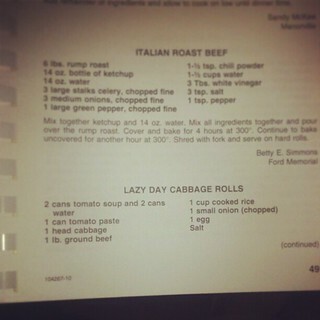 This entry was posted in Casseroles to Go, Healthier Choices and tagged cabbage rolls, casserole, heart healthy. Bookmark the permalink.